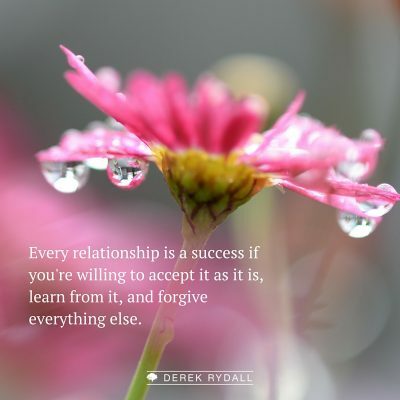 When marriage researcher Dr. John Gottman followed up with couples who had attended one of his workshops, he noticed a difference between the couples whose relationships continued to improve after the workshop and the couples whose relationships did not continue to improve. Surprisingly, the difference was not that the couples who improved made dramatic changes in their relationships, but rather that the couples who improved were devoting about six hours of time to the relationship each week. How each couple used these six hours varied, but Dr. Gottman recognized some patterns in how the couples spent their time and used his observations to come up with a formula that couples can use to improve their relationships. Below is a graphic that shows how to break up the six magic hours and improve your relationship. 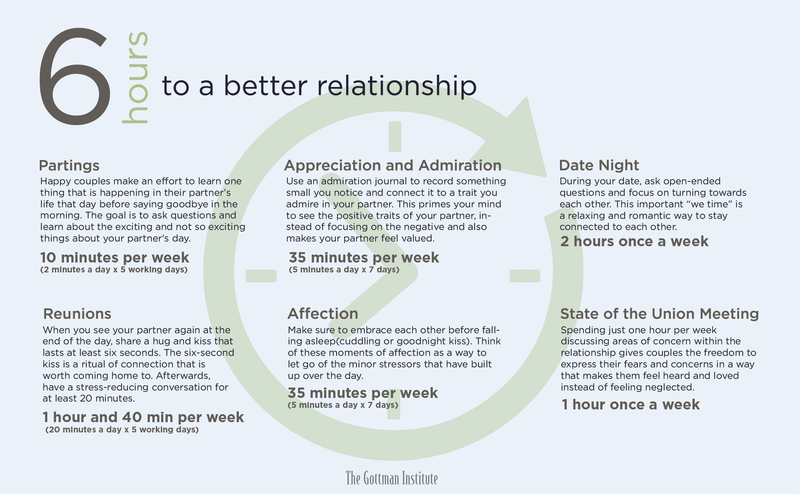 The article "6 Hours a Week to a Better Relationship" discusses the ideas from the graphic in more depth and you can click here to read the article. The news today often covers traumatic events such as bombings, shootings, and other tragedies and children are being exposed to news of these events more and more frequently. Parents need to be able to help their children process and understand these events while also helping to ease the fear that children experience surrounding these types of events. The article "Helping Kids Process News Reports of Violence" provides some guidance for talking to children about these events. It is important that children know they can express their fears to their parent and that the parent listens to these fears rather than trying to downplay them. It is also important to provide children information that is appropriate for their age and their personality characteristics, such as their level of maturity and their temperament. Helping children understand how seldom these tragedies actually occur can also help them feel safer. If you often find yourself in a negative or pessimistic mindset you might have an ANT (Automatic Negative Thought) problem! ANTs are negative thoughts that seemingly pop into your head all by themselves and can greatly limit your ability to enjoy your life. After all, the thoughts you have from moment to moment impact your overall mood and if your mood is low it is not likely that you will expect good things to come your way. Each time that you have a thought your brain releases chemicals and negative thoughts can effect the deep limbic system leading to irritability, depression, and other mood problems. The key to repairing the deep limbic system is learning to control your thoughts and direct them in a positive way. In his article about ANT therapy, Dr. Daniel Amen discusses the different categories of ANTs and gives examples of each. He also provides step-by-step instructions on how he helps patients overcome ANTs in his therapy practice. The article includes an exercise to help you identify ANTs, identify the type of negative thought, and learn to talk back to your irrational thoughts. If you want to develop your own inner anteater to help you overcome negative thoughts and develop a more positive outlook, click here to read the article. "Life does not consist mainly - or even largely - of facts and happenings. It consists mainly of the storm of thoughts that is forever blowing through one's head." National Infertility Awareness week is April 22-28, 2018. One in eight couples struggles to have a child and infertility can affect anyone of any age, race, religion, or socioeconomic status. To raise your awareness about the disease of infertility, please visit RESOLVE: The National Infertility Association’s webpage to read real stories and find ways you may wish to get involved. How will you #FlipTheScript? 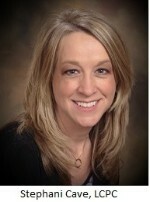 Check out ways others are changing the conversation about infertility. We at ConnectEdPAIRS hope you had a wonderful Easter. If anyone played an April Fool's trick on you, we hope that it was mild. The newsletter topics this month are timely and timeless. I use the Gottman 6-hour handout often with couples I see in counseling. 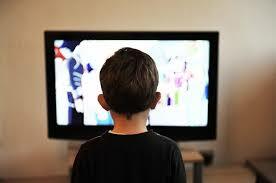 Our Family article provides timely information as our children can be exposed daily to news of tragic events. I use cognitive therapy often with my clients and provide them with Dr. Amen's ANT metaphor. For the Infertility corner, I hope you take some time to educate yourself about the disease of infertility. If infertility does not affect you personally, then chances are it is affecting someone you know, whether or not he or she is talking about it.